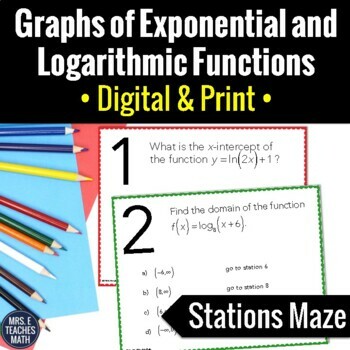 I just realized that I haven't shared any of my interactive notebook pages from my Exponential and Logarithmic Functions unit in Algebra 2! In Algebra 2, exponentials and logs is one of my favorite units. 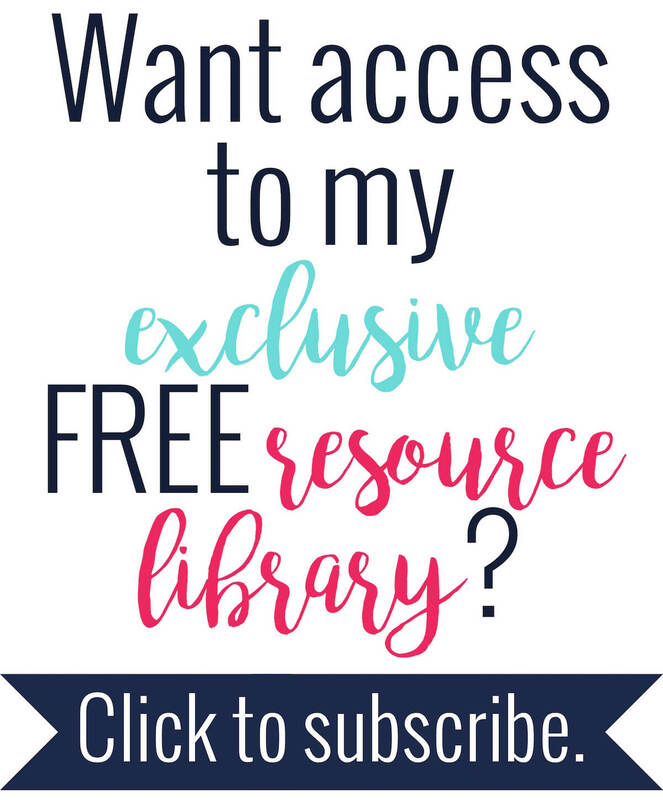 It is something totally new for all of my students and it has awesome real-life applications. 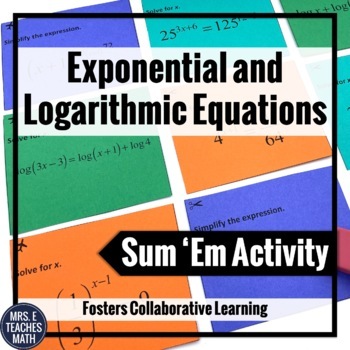 I start the unit with exponential functions and then do a "super fun" puzzle to introduce log functions. First, I taught students how to solve exponential equations. 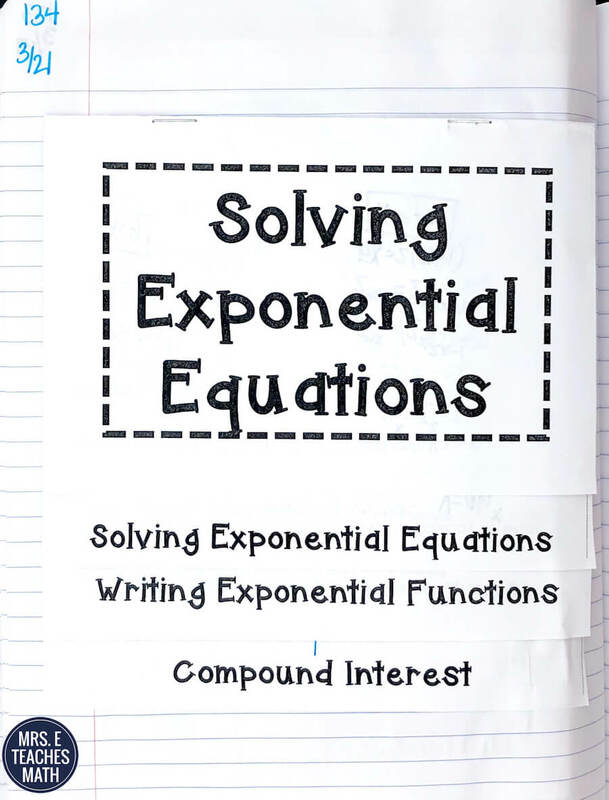 Before I hand out the flipbook, I like to put an easy exponential equation on the board and ask students if they have any idea about how to solve it. Kids either give up immediately or want to try to plug in numbers until they find a solution. We go through the flipbook mostly together and they usually don't struggle with this lesson. I try to really explain compound interest and hint that we will talk more about it as the unit progresses. You can find the flipbook here. 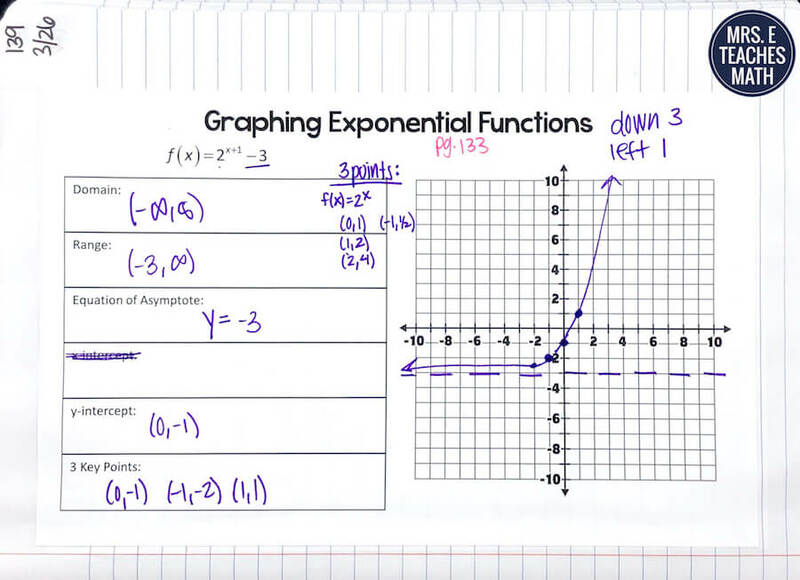 Then, I move on to teaching them how to graph exponential functions. I can't find those INB pages. Sorry! I can tell you that they weren't fancy though! Then, I move on to introducing logarithms. If you haven't checked out my post about How I Teach Intro to Logs, then you need to! 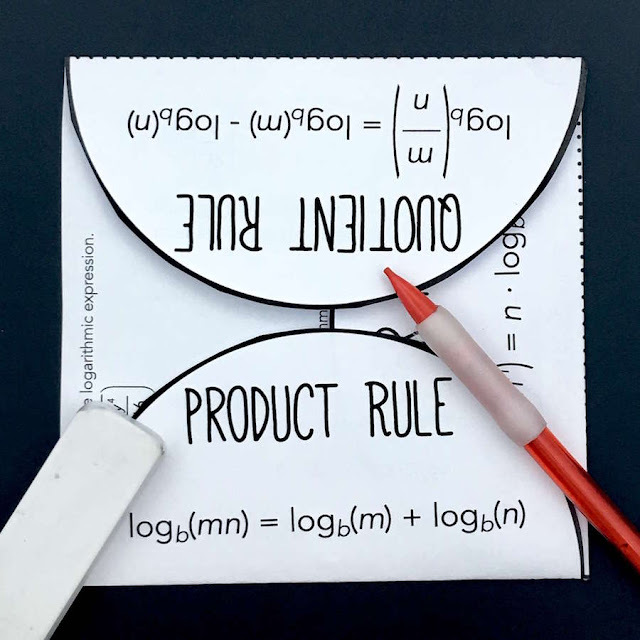 I love using the super fun puzzle to see how students think and see if they can figure out logarithms on their own. I have students copy the super fun puzzle into their notebooks so that they have it as a reference later. Once we've had fun with the puzzle, I jump right in to properties of logarithms. Some students may need a day to process and practice converting from logarithmic and exponential form. I've always taught honors students, so mine haven't needed that extra time. I like using this foldable to show the properties. It's a different shape, which is always interesting, and the properties are shown on the flaps. The center of the foldable has students expand and condense expressions. You can find the foldable here. After that, I like to spend an extra day or two having my students practice expanding and condensing logarithmic expressions. 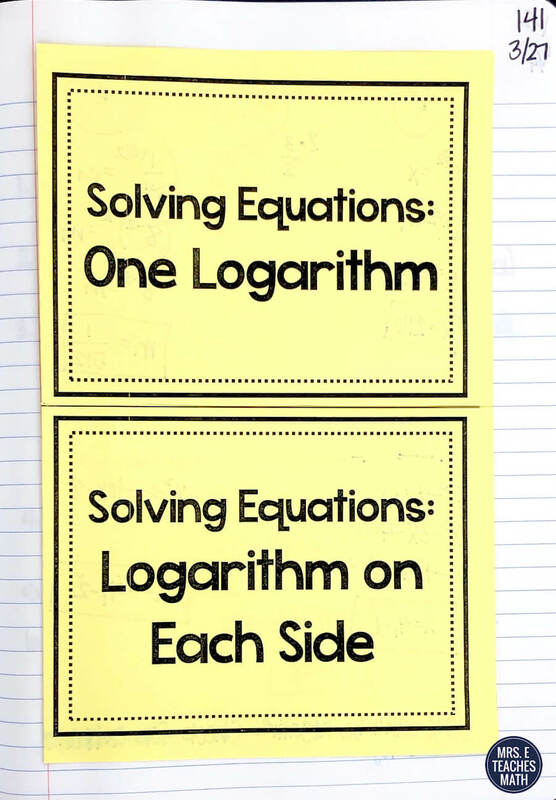 If students can condense well, then solving equations will be easier for them later. 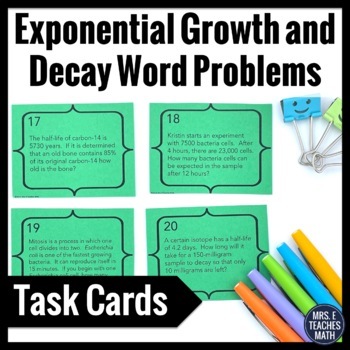 You can check out this post to see how I used whiteboard practice to help my students practice expanding and condensing. 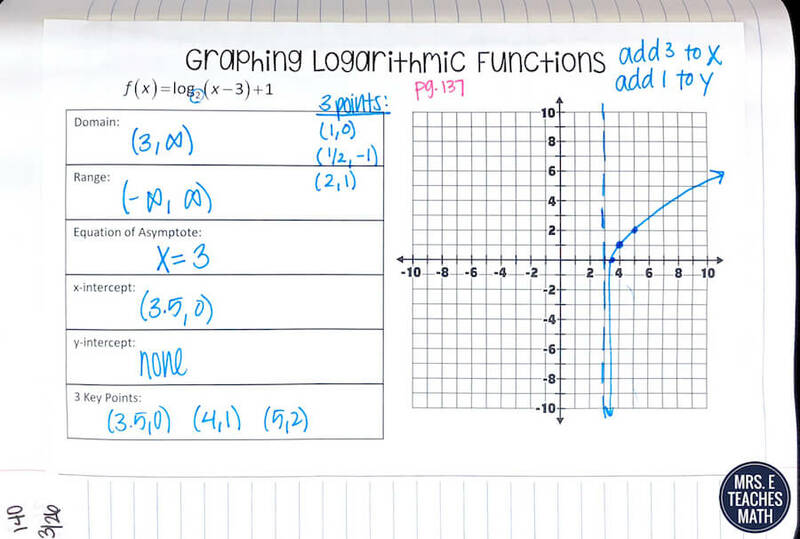 Then, we moved on to graphing logarithmic functions. In retrospect, I think it might be better if I had taught how to solve logarithmic equations next. Students are kind of on a roll after expanding and condensing so it would be better to capitalize on it. I used this free foldable for introducing logarithmic functions. One flap has the graph of the parent function with all the characteristics. 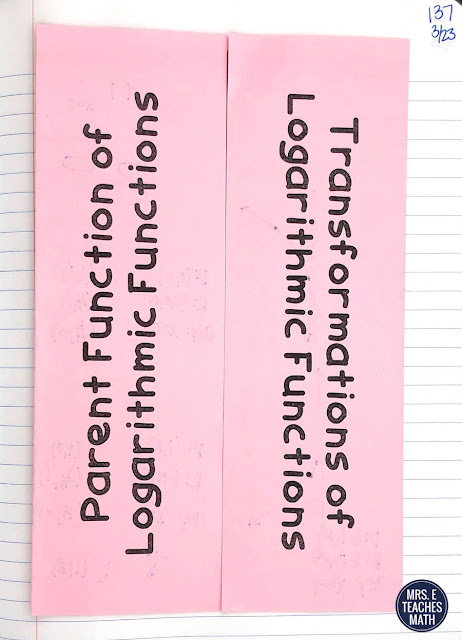 The other flap has transformations of logarithmic functions. When we finished the graphs, I had my students find the inverses. This page went pretty quickly and wasn't too hard for them. Last year, my students struggled more with graphing than previous years. So, I had an extra day to review graphing logarithmic and exponential functions. I used these pages to help students practice and I let them work with partners. I can't find the file now, but if I do I will post it. At the end of the unit, I taught my students how to solve logarithmic equations. I need to get the file for this one too. I'm sorry! There was absolutely no information inside though, it was just typed out equations. My students had several other pages within this unit, but most of them were handwritten. Yes, I included natural logs :) At this point in the school year, I try to start letting them take some of their own notes. This unit is where I start to loosen the hand holding a bit. I LOVE this unit! 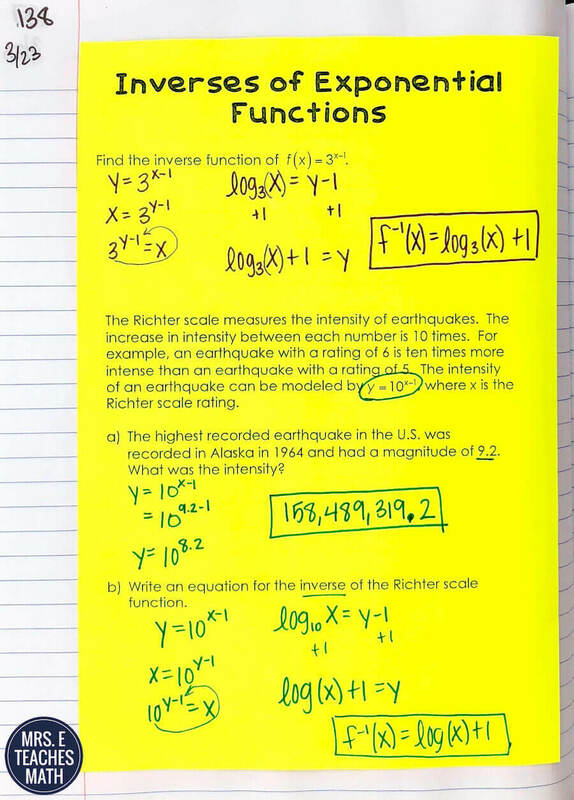 Even though the interactive notebook pages look unassuming, they get the job done. I also love using lots of activities in this unit.